Mars is the most accessible planet beyond the Earth-Moon system but the challenges of exploration are required to be well-understood to sustain a permanent human presence there. 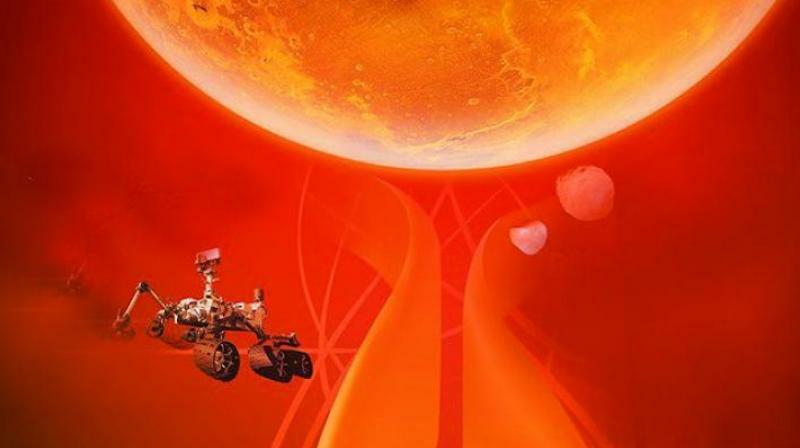 Mars being the most accessible planet beyond the Earth-Moon system where sustained human presence is believed to be possible, the challenges of Mars exploration are required to be well-understood to sustain a permanent human presence beyond Earth. Long-term human spaceflight presents a difficult set of challenges; unlike robots, humans must be fed, hydrated, protected, entertained, and most importantly, they need to be brought back home safely. There is a saying: “Everything is difficult until you Do”. Similarly, “Without knowing what to do, we can’t do anything”. Here it is attempted to enumerate the key and important challenges of a manned mission to Mars which are: mission design, propulsion system requirements, human health, In Situ Resource Utilisation (ISRU), crew autonomy, power system, system reliability and landing and ascent. Typically, a manned crew mission would be preceded by a number of pilot missions (at least 3 to 6). Pilot missions mainly consist of cargo missions and an Earth return vehicle mission. Cargo flights will need to comprise a lander carrying a Mars ascent vehicle (MAV) and additional supplies consisting of living units, life-support units and supply units. This sequence gradually builds up assets on the Martian surface, so that at the end of the cargo flights the basic infrastructure could be in place. More cargo launches may be required to instal backup systems for the crew. Also, an unmanned rover mission may also be proposed to be launched to Mars in order to scout a landing site. Cargo missions could use aerobraking or aerocapture techniques to minimise the propellant requirement for MOI. Aerobraking is a spaceflight manoeuvre that reduces the high point of an elliptical orbit (apoapsis) by flying the vehicle through the atmosphere at the low point of the orbit (periapsis). The resulting drag slows the spacecraft. Aerobraking is used when a spacecraft requires a low orbit after arriving at a body with an atmosphere, and it requires less fuel than does the direct use of a rocket engine. Aerocapture is a related but more extreme method in which no initial orbit-injection burn is performed. Instead, the spacecraft plunges deeply into the atmosphere without an initial insertion burn and emerges from this single pass in the atmosphere with an apoapsis near that of the desired orbit. Several small correction burns are then used to raise the periapsis and perform final adjustments. Another related technique is that of aerogravity assist, in which the spacecraft flies through the upper atmosphere and utilises aerodynamic lift instead of drag at the point of closest approach. If correctly oriented, this can increase the deflection angle above that of a pure gravity assist, resulting in a larger delta-v. The crew will have to travel to and from Mars on relatively fast transits (4 to 6 months) and will spend long periods of time (18 to 20 months; 600 days nominal) on the surface, rather than alternative approaches which require longer time. Shorter transit times reduce the time spent by the crew in zero gravity. Also, relatively fast transits will reduce the exposure to galactic cosmic radiation and the probability of encountering solar particle events. Reducing the exposure to zero gravity and radiation events helps reduce the risk to the crew. Further, to improve communication with crew after Mars landing, is an option to possibly launch a communication satellite, which will enable continuous communication with the future landed asset. An areostationary orbit or areosynchronous equatorial orbit is a circular areo­synchronous orbit in the Martian equatorial plane about 17,032 km above the surface, any point on which revolves about Mars in the same direction and with the same period as the Martian surface. Areo­stationary orbit is a concept similar to Earth’s geo­stationary orbit. The baseline propulsion system used for trans-Mars injection is a LOX/LH2 propulsion stage atop the Launch Vehicle. For transfers from Low Earth Orbit (LEO) toward Mars using LOX/LH2 propulsion, roughly 55% (or 65%) of the mass in LEO is required for the propellant and the propulsion stage, and 45% (or 35%) of the mass in LEO consists of payload that is sent on its way to Mars. For Mars, the actual propulsion requirements depend on several factors e.g., the specific launch opportunity and the desired duration of the trip to Mars. One can either use a lower-energy trajectory with a trip time of typically 300±400 days that requires less propellant (appropriate for cargo transfer), or a higher energy trajectory that uses more propellant with a trip time of typically 170 to 200 days (appropriate for crew transfer). The LOX/LH2is the most efficient form of chemical propulsion that is available. The technology for use of LOX/LH2 propulsion for Earth departure is fairly mature. Even though LOX/LH is the most efficient form of chemical propulsion, the requirement that three mass units in LEO are required to send one mass unit on its way toward Mars is a major factor in driving up the Initial Mass of LEO (IMLEO) for Mars missions. The use of nuclear thermal rocket (NTR) partly mitigates this heavy requirement. When nuclear thermal propulsion (NTP) is utilised for Earth departure, two important factors are the minimum altitude allowed for start-up and the propulsion system dry mass fraction. The use of NTP in place of LOX/LH2 for Earth departure can reduce Initial mass in low earth orbit (IMLEO) by 40%. Another option is to use Solar electric propulsion for orbit raising. Solar electric propulsion could be used to raise the orbit of the spacecraft from LEO to a high Earth orbit, and thereby greatly reduce the propulsion requirements for Earth departure. Further, from an elongated elliptical Earth orbit, the chemical propulsion is used and trans Mars injection in this case requires far less propellant. The energy that would have been used for departure from LEO using chemical propulsion is mostly replaced by solar energy that drives the electric propulsion system used to raise spacecraft to a high orbit. These options could be used for carrying assets to Mars Surface as the time required to travel is much longer. Also, aero-assisted Mars orbit insertion and entry, descent, and landing maybe required for the cargo missions.